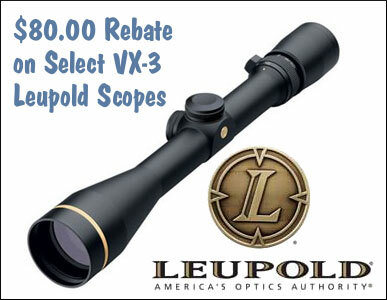 Leupold is now offering an $80.00 rebate on select VX-3 rifle scopes. The qualifying optics are: Leupold VX-3 3.5-10x40mm (SKUs 59260, 66090, 66110) and Leupold VX-3 4.5-14x40mm (SKUs 59270, 66215, 66220, 66225). This offer is limited in time. The scope(s) must be purchased from August 2nd through September 30, 2012. To get your $80 rebate, complete and return the Leupold Rebate Form with the original on-line or store sales receipt, plus original UPC bar code cut from the product packaging (originals only, copies not accepted). Mail these materials to: Leupold VX-3 Riflescope Promotion, Dept. # LS12-8710, P.O. Box 472, Scottsdale, AZ 85252-0472. CLICK HERE to download Leupold Rebate Form. Share the post "Get $80.00 Rebate on Select Leupold VX-3 Scopes"